Dan Armstrong is Mud City Press' resident writer. He's selling six novels and a collection of short stories on our Buy a Book page, but you might like to sample some of his shorter work before trying one of the novels. The following five stories come from his collection THE OPEN SECRET. Please note that Dan gives a few of his stories an adult rating, marked with an (R). Does the reading of your fortune change it? 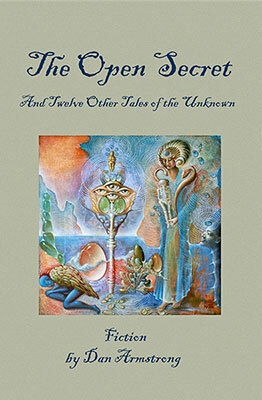 (R) Illustrated with the visionary artwork of Martina Hoffmann. In what kind of container do you put the immaterial? Sometimes it's the things that are most obvious that we don't see at all. It's better not to say anything at all than to try to tell everything at once. BUY NOW from Mud City Press for $8.00 plus shipping. Or purchase from Amazon.com or buy as a Kindle application for $3.99.